There is nothing more disappointing than hopping into a hot shower on a chilly day only for the water to quickly turn cold. There are a number of factors that can contribute to hot water problems and luckily some of them are simple fixes. 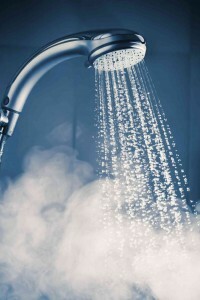 So if you have ever had a problem with the hot water in your shower, be sure to read on to learn more about what could be causing it and how it can be fixed. Learn why your hot water is running cold. If you have noticed that your water gets chillier slowly, it could be because of an issue with your pressure balance. In the case that you have a temperature control faucet, a small spring could be to blame. Inside the faucet there is a spring that adjusts the temperature of your hot water as needed. As that spring wears out, your shower may start hot and slowly get chillier. Replacing that spring may just solve your problem. If your hot water seems to last mere moments before running cold, it could be an issue with your dip tube. The dip tube is a pipe which connects to your water heater’s cold water inlet pipe and brings cool water to the heater. As this water warms, it rises through the heater and exits through the top via the hot water outlet. However, sometimes a dip tube can accidentally be shifted in a way that allows it to discharge cold water to the top of your water heater. If this is the case then you should call an experienced plumber who will be able to fix your dip tube if it is deemed necessary. The most common cause for temperatures to drop during a shower is simply because you have run out of hot water. If you have a traditional hot water heater which stores the heated water in a tank then you have a finite amount of hot water that can be used at one time. If you frequently find yourself running out of hot water then you may want to explore the option of investing in a tankless hot water heater so you’ll never have the problem again! This entry was posted on Thursday, October 8th, 2015 at 5:21 pm. Both comments and pings are currently closed.